: requires a Kenyon network connection. "The Dunhuang Chinese Sky: A Comprehensive Study of the Oldest Known Star Atlas"
This is an on-going project to compile an annotated list of all the important travelers on the Silk Road. The travels are arranged in chronological order. Each entry will include a brief description, highlighting where possible issues such as where the person went, and why the journey and its record are important. Our initial selection concentrates on accounts of travels prior to the eighteenth century. Do not be alarmed that some obvious names have not yet appeared on the list. We are working to fill in gaps as fast as we can; to some extent, our initial selection was dictated simply by what we could most easily complete in a short time. Once we are somewhat farther along in our coverage, we will post a list of additional individuals whom we intend to include; at that point we will be pleased to receive suggestions about significant omissions. We have chosen primarily travelers who left accounts based on their travels and whose accounts are generally considered to provide valuable historical and cultural information. Our main concern is with overland travel, although in some instances we include accounts about the sea routes around south Asia to the Middle East. Although we are starting with "early" travelers, the list eventually will include important explorer/travelers from modern times (down into the twentieth century). In certain cases, we will include descriptive accounts of the Silk Road even if the authors or compilers may not actually themselves have traveled in the areas described. Well-known travelers such as Marco Polo or Ibn Battuta often describe places we know they did not visit. Although we might not think of him as a traveler, an individual such as Ibn Khurdadbeh (who was "postmaster general" of the Abbasid Caliphate in the 10th century) deserves to be included here as well, since he tapped into the expertise of individuals who had in fact traveled on the routes he describes. We include travelers whose accounts are available in Western languages. However, some cases are so important that we include them even if no translation is available. Perhaps this will serve as an incentive for those accounts to be translated. Each entry includes selected bibliographical references (linked from a separate file). Where they exist, English or other Western language texts or translations are cited for the original travel accounts (designated as "primary sources"). Even if there is a new translation which supersedes previous ones, we may include the older versions, since they may be more readily accessible. We also include selected secondary literature about the particular traveler and, where possible, annotate the bibliographic entries to explain the value of the work cited. In many instances, the choice of what to include in the bibliography reflects our perception of the relative accessibility of the item for those who may not have access to a major research library. Works that have received wide attention (whether or not they merit it) may be cited precisely because they are "well known." While we hope that the individual bibliographical references are full and accurate, we are not attempting here to provide the kind of comprehensive coverage that specialists would require. Thus we normally do not cite primary sources in their original language editions, if those languages are non-western. Suggestions for additions to the bibliography within the stated guidelines would be welcome. -959 King Mu (Mu Wang),. West Chou king and the earliest reputed Silk Road traveller. His travel account Mu tianzi zhuan, written in the 5th-4th century BC, is the first known travel book on the Silk Road. It tells of his journey to the Tarim basin, the Pamir mountains and further into today's Iran region, where the legendary meeting with Xiwangmu was taken place. Returned via the Southern route. The book no longer exists but is referenced in Shan Hai Zin, Leizi: Mu Wang Zhuan, and Shiji. -138-116. Zhang Qian (Chang Ch'ien). Chinese general and envoy credited with opening the Silk Road after his mission from the Han Emperor Wudi to recruit the Yueh-chih people to form an alliance against the Xiongnu. 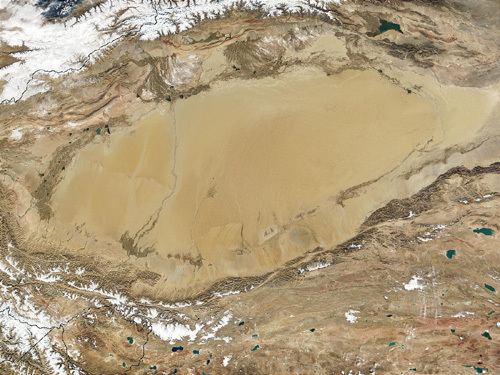 First trip (138-125) skirted the Taklamakan desert via the northern route, passed the Pamir, then reached Ferghana. Returned via the southern route. His second trip (119-115), a mission to seek alliance with Wu-sun people, took him to Dunhuang, Loulan, Kucha, then the capital of Wu-sun kingdom in the Ili river. His missions to the west led to the formalization of trade, especially the silk trade, between China and Persia. Read more.... Read the bibliography. 40-70. Anonymous author of the Periplus of the Erythraen (=Red) Sea. A merchant handbook, written apparently by an Egyptian Greek, about trade routes through the Red Sea and involving both East Africa and India. One of the most important sources for Roman Eastern trade, compiled after the discovery of how to use the monsoon winds to make the round trip to India. Includes extensive information on ports and products. Read the bibliography. 73-102. Ban Chao (Pan Ch'ao). Chinese general restoring the Tarim basin under Han's power and maintaining whole control of the area as west as Kashgar during his career there. He sent out emissaries to the area west and beyond the Tarim basin, including the area of modern-day Iran and the Persian Gulf. Read the bibliography. 97 Gan Ying (Kan Ying). First Chinese envoy to Ta-Ts'in (the Roman Orient) sent by general Ban Chao from Kashgaria in 97 AD. Journeyed through the Pamir mountains, Parthia, and reached as far as the the coast of the Persian Gulf. However he was dissuaded from continuing further west. The first known Chinese visited the Middle East as west as T'iao-chih, near the present Nedjef, Iraq. Read the bibliography. 399-413. Faxian (Fa-hsien). First Chinese monk reaching Indian and returning with a knowledge of Buddhism. 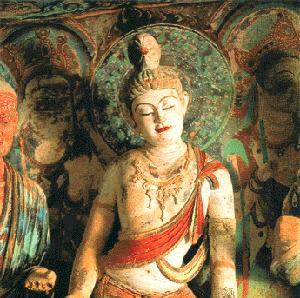 Traveled the southern route through Shenshen, Dunhuang, Khotan, and then over the Himalayas, to Gandhara, Peshawur then India. He journeyed most of the way on foot and was the first known traveler passing through the Taklamakan desert from Woo-e to Khoten. Returned to China via the sea route. Read more....Read the bibliography. 518-521 Song Yun (Sung Yun)/Huisheng. Sung Yun of Dunhuang went with a monk Huisheng on a mission sent by the Empress Dowager to obtain the Buddhist scriptures in India in 518. Travled through the Taklamakan desert via the southern route passing Shanshan, Charkhlik, Khotan, then further west into the Hindu Kush, Kabul, Peshawar. The most interesting account is their visit to the Ephthalites (the White Hun) kingdom, who centered in eastern Afghanistan and controlled much of the Central Asia during the 5th and 6th centuries. Both wrote a travel account but none remained. 713-741. Hwi Chao. Korean monk but grew up in China. Traveled to India via sea route (route unclear). Lived there for several years and visited various Buddhist kingdoms in India, Persia and Afghanistan. On the returning journey, traveled to Kashmir, Kabul, passed the Pamirs and entered Xinjiang from Tashkurgan, then skirted around the Taklamakan desert from the northern towns, Kucha, Turfan and Hami. His account Wang wou t'ien tchou kquo tch'ouan or The Record to Five Indian Kingdoms provided vaulable information on the Islamic and Buddhist distribution among the Central Asian kingdoms during the 8th century. His book had been lost since Tang dynasty until an incomplete copy (14 pages, ~6000 words) was miraculously discovered by the French explorer, Paul Pelliot at Dunhuang cave in 1908. 751 - 762 Du Hwai. Chinese soldier defeated and prisoned by the Arab at the famous battle of Talas in 751. Stayed in the prison camp for ten long years and traveled to Tashkent, Samarkand, passed northern Iran to Iraq, west into Syria. On the Perisan Gulf, he boarded a foreign ship, returned to Canton via Indian Ocean and South China Sea. His book is a personal account of Talas battle and his prison life in Central Asia. 750-789 Wukong (Wu-K'ung). Chinese monk went as a delegation with the ambassador from Samarkand who was returning home. He fell ill there and could not return with his countrymen. On his recovery he became a monk and lived in Gandhara and Kashmir, not returning to China until 790 Read the bibliography. 821. Tamim ibn Bahr. According to Minorsky, "the only Muslim traveller who has left a record of his visit to the Uyghur capital on the Orkhon, i.e., to Khara-balghasun in the present-day Mongolia." The author likely was from Khorasan and was sent to the East in connection with political upheavals in Transoxiana. Only an abridged version of his narrative survives, known especially from Yaqut's geographical dictionary. Read the bibliography. 921-922. Ahmad Ibn Fadlan.Sent as ambassador from the Abbasid Caliph to the ruler of the Bulgars on the middle Volga River. The route went from Baghdad via the territories of the Samanid state and its capital Bukhara, through Khwarezm and north of the Caspian Sea. Although the account we have is not the original report, it has great value, since Ibn Fadlan "possessed extraordinary powers of observation." (Canard). The account is often best known for its rather lurid but valuable description of a Viking (Rus) funeral on the Volga; this served as the inspiration for a best-seller by the novelist Michael Crichton, Eaters of the Dead.Read the bibliography. 1219-1225. Yeh-l� Ch'u-ts'ai. Great Kitan statesman and poet who became advisor to Genghis Khan and his successors. Traveled with Genghis Khan and his army to Central Asia in 1219. Journeyed to Altai, Ili valley, Talas, Samarkand, Buhara. His impression on the prosperous Buhara can be read on some of his poems. Returned via Tienshan, Urumqi, Turfan, and Hami. His travel book Xi Yue Lu (The Travel Record to the West) is only available in Chinese.Read the bibliography. 1245-1247, 1249-1251. Andrew of Longjumeau. A Dominican and papal envoy to the Mongols, traveled from the Holy Land to vicinity of Tabriz (N. Iran) on his first trip. On the second, accompanied by several others including his brother William, went much farther (his route is not well documented) to the inner Asian dominions of the Mongols, where he arrived during the regency of Oghul Qaimish, the widow of Khan G�y�g. We know of his journeys from summaries in Matthew Paris's Chronica Majora. Read the bibliography. 1220-1221. Wu-ku-sun Chung tuan.Accompanied by An T'ing chen, sent as ambassador of the Jin emperor to Chingis Khan, whom he found apparently in the Hindukush mountains (today's Afghanistan), not "the North." The Pei shi ki (Notes on an Embassy to the North) is a written version of his oral report copied in the Chi pu tsu chai ts'ung shu. Bretschneider indicates the "narrative is of little importance." Read the bibliography. 1221-1224. K'iu Ch'ang Ch'un and Li chi ch'ang. An eminent Taoist monk born in 1148 CE and thus elderly at the time of his trip, Ch'ang Ch'un was ordered by Chingis Khan to travel to his court. The route went through the Altai and Tienshan mountains, the southern parts of today's Kazakhstan, through Kyrgyzstan, to Samarkand and then down into NE Iran and Afghanistan. He was accompanied by Li Chi ch'ang, who wrote the Hsi Yu Chi, a rather detailed diary of the journey; it was published with an introduction by Sun si in 1228 and included in the Tao tsang tsi yao. Bretschneider feels that this account "occupies a higher place than many reports of our European mediaeval tavellers." Read the bibliography. 1245-1248. Ascelinus and Simon of San Quentin. Dominican envoys of the Pope to the Mongols, who went from the Levant into the southern Caucasus and returned (accompanied by Mongol envoys) via Tabriz, Mosul, Allepo, Antioch and Acre. There is information about the embassy in Matthew Paris's chronicle as well as in an account written by Simon of San Quentin, which has not been translated into English. Read the bibliography. 1245-1247. John of Plano Carpini (Pian del Carpine) and Benedict the Pole. Franciscan monks sent as envoys of Pope Innocent IV to the Mongol Khan. Traveled through the dominions of Khan Batu (ruler of the "Golden Horde") to the vicinity of Karakorum, where they witnessed the proclamation of G�y�g as the new Great Khan. Where he is discussing that which he actually saw, Friar John's account ("History of the Mongols"/Historia Mongalorum) is "the first direct authentic description of Asia" (Olschki) and one of the most perceptive and detailed accounts we have of the Mongols in the thirteenth century. Considering his European Christian perspective, it is surprisingly unbiased. It became quite widely known in Europe through excerpts in an encyclopedia compiled by Vincent of Beauvais, the Speculum Historiale. Read the bibliography. 1253-1255. William (Guillaume/Willem) of Rubruck (Ruysbroeck). Franciscan missionary from Flanders who traveled through the Black Sea and the territories of the Golden Horde to the court of the Great Khan M�ngke at Karakorum. His account (Itinerarium) is "a mine of varied information about the Asiatic life of his times" (Olschki). It contains "the fullest and most authentic information on the Mongol Empire in its pre-Chinese phase" (Dawson); it is of interest for descriptions of encounters with Nestorian Christians, of Karakorum itself and the palace which is no longer extant, and much more. Although his experiences interested his contemporary Roger Bacon, Rubruck's account did not become widely known until it was translated and published late in the sixteenth century. Read the bibliography. 1254-1255. Hayton I (also, Hethum, Haithon) and Kirakos Gandsaketsi. King of Little Armenia, Hayton traveled through the Caucasus and territories of Khan Batu to the Great Khan M�ngke in Karakorum and then back via Samarkand, Bukhara and Tabriz. The account of his travels was written down by Kirakos, who accompanied Hayton. This account is not to be confused with a descriptive narrative of the Near East written by Hayton's nephew of the same name. Read the bibliography. 1259-1260. Ch'ang Te.Envoy from Mongol Khan M�ngke to his brother H�leg� soon after the latter's conquest of the Abbasid Chaliphate. Ch'ang Te's Si Shi Ki, recorded by Liu Yu, is part travel diary and part a second-hand account of H�leg�'s campaigns in the West. Its geographical information is inferior to that of Ch'ang Ch'un. Read the bibliography. 1260-1263. Yeh-l� Hi Liang. Great-grandson of Yeh-l� Ch'u-ts'ai, who, with his father, worked for M�ngke Khan and then Qubilai. His biography in the Y�an-shi relates his travels in Inner Asia in the period of the Mongol civil war prior to Qubilai's consolidation of power. Read the bibliography. 1260-1269, 1271-1295. Niccol� and Maffeo Polo. The merchant father and uncle of Marco Polo traveled from the Crimea through the other territories of the Golden Horde to Bukhara and ultimately to the court of Qubilai Khan in North China. Qubilai sent them back to Europe on a mission to the Pope via the overland route; they arrived in Venice in 1269. When they departed again for China in 1271 via the Levant, Anatolia and Persia, they were accompanied by young Marco. Our knowledge of their travel is from Marco's book. Read the bibliography. 1271-1295. Marco Polo. The most famous of the Silk Road travelers, who, by his own account, worked for Qubilai Khan. He traveled overland through Persia across the Pamirs and south of the Taklamakan; his return was by sea from China around south Asia to Hormuz, whence he went overland to the Mediterranean. A Venetian, Marco dictated his account to a professional writer of romances while imprisoned by the Genoese on his return. It is important to remember he was not keeping a diary. Olschki calls it "not...a book of travel and adventure, but a treatise of empirical geography." Clearly some of the descriptions are formulaic, others not based on direct observation, and others reflecting the common stock of travel mythology. Many of his observations are precise and verifiable; others unique but likely accurate. Since his main associations seem to have been with the Mongol rulers of China and with the Muslim merchant community, often he is silent about "obvious" features of Chinese society. Polo's book became well known in Renaissance Europe and served as a stimulus to further travel and discovery. Read the bibliography. 1275-1279. 1287-1288. Rabban Bar Sauma and Markos. �ngg�d (Turkic) Nestorian monks who traveled from Tai-tu, Qubilai Khan's northern capital, to the Middle East, via the southern branch of the Silk Road (through Khotan and Kashgar). Although on a pilgrimage to Jerusalem (which they never reached), they seem to have had official sponsorship from the Khan. Once in the Mongol Ilkhanid realms, they became involved in Nestorian church politics, and Markos eventually was elected head of the church as Patriarch Mar Yaballaha III. Bar Sauma was sent to the West as an emissary of the Ilkhanid ruler Arghun in 1287, with the goal of concluding an alliance against the Mamluks. Bar Sauma's writings were preserved in an abridged translation into Syriac, from which there are several translations into modern languages. As Rossabi notes, "His narrative remains the only one of its era to provide an East Asian perspective on European ways and rites," even though it is somewhat disappointing in detail about life in the places through which he traveled. Like their contemporary, Marco Polo, the travelers are not mentioned in any Chinese sources. Read the bibliography. 1279-1328. John of Monte Corvino. Franciscan missionary, active in Armenia and Persia, and then in India and China. He left Tabriz for India in 1291 and arrived in Beijing probably after the death of Qubilai Khan in 1294. He was elevated to the rank of Archbishop in ca. 1307 and continued to head the Catholic mission there until his death. Although he did not write a travel narrative, several of his letters have been preserved. Read the bibliography. ca. 1316-1330. Odoric of Pordenone. Franciscan monk who traveled via Constantinople and the Black Sea to Persia, and then via the Indian Ocean to India in the early 1320s. From there he sailed around southeast Asia to the east coast of China and spent several years in Beijing. His claim to have returned via Tibet is dubious, although he apparently traveled overland, arriving back in Venice via the Black Sea and Constantinople. His lengthy travel account, which he dictated in 1330, became a "best seller," in part because of Odoric's indiscriminate mixture of tall tales with more authentic information. He occasionally notes aspects of Chinese culture that were ignored by Marco Polo, "with whose account he was certainly familiar" (de Rachewiltz). Important portions of his material were re-worked and given a further fictional gloss by the author of the very popular late medieval travel fable attributed to John Mandeville. Read the bibliography. 1325-1354. Ibn Battuta. A native of Tangier (Morocco), Shams al-Din Abu 'Abd Allah Muhammad Ibn Battuta (1304-1368/9 or 1377) is famous for spending the years between 1325 and 1354, when he returned home, traveling across North Africa and through much of Eurasia, all the way to China. His initial goal was to participate in the pilgrimage to Mecca (the hajj); his interest in Muslim holy men and places dominates portions of his text. While he may have kept notes, the account as we have it is "a work of literature, part autobiography and part descriptive compendium" (Dunn). It was dictated to Ibn Djuzayy between 1354 and 1357. Some sections clearly do not contain eye-witness material; chronology is often confused. There are critical views of the value of his material on Iran and questions about how much he saw in China. Among the most valuable sections are his descriptions of Anatolia, the territories and customs of the Golden Horde, and Southern India. Read the bibliography. 1339-1353. John of Marignolli. Franciscan sent as papal legate to Y�an (Mongol) Emperor of China. Entered the lands of the Golden Horde via the Black Sea. His route probably ran through Urgench (S. of Aral Sea), via Hami (north of the Taklamakan) to Beijing and Shang-tu, where he was received in August 1342. After three years, headed home via ship to Hormuz and then overland to the Levant. Included his travel recollections in his chronicle of the history of Bohemia; his account was ignored until the nineteenth century. Read the bibliography. 1340. Francesco Balducci Pegolotti. A Florentine merchant, Pegolotti was active in the Eastern Mediterranean in the second quarter of the fourteenth century, at which time he acquired first- and second-hand information on the Asian trade. While he himself never travelled further east, his account is of particular interest for its description of the relative security of trade routes through the territories of the Mongol Empire and the great variety of products available in commercial centers such as Constantinople by about 1340. His merchant handbook survived in a copy made in 1471. Read the bibliography. 1403-1406. Ruy Gonzales de Clavijo and Alfonso Paez. Ambassadors of Spanish King Henry III of Castile and Leon to Timur (Tamerlane). A third envoy, G�mez de Salazar, died en route. Traveled through the Mediterranean to Constantinople, into the Black Sea to Trebizond and then overland via Tabriz to Balkh, Kesh (Shahr-i Sabs) and Samarkand. On return journey, they passed through Bukhara. Clavijo's account, written soon after his return in 1406, is a very important source for travel on the western part of the Silk Road. Its description of Tamerlane's Samarkand is one of the fullest available and includes substantial detail on economic life, trade with India and China, and Timurid buildings. Read the bibliography. 1413-1415, 1421-1422, 1431-1433. Ma Huan. Muslim interpreter who accompanied the famous Ming admiral Ch'eng Ho (Zheng He) on his fourth, sixth and seventh expeditions to the Indian Ocean. His Ying-yai sheng-lan (Overall Survey of the Ocean's Shores) (published in 1451) contains valuable information on geography, products and trade in Southeast Asia, South Asia, and the Middle East. On the first two voyages, he went as far as Hormuz; on the third he apparently reached Mecca. Read the bibliography. 1419-1422. Ghiyathuddin Naqqash. Artist representing Prince Mirza Baysunghur, son of Timurid ruler Shahrukh, in embassy sent by latter to Beijing in 1419. Describes travel via route north of Tarim Basin (through Turfan, Jiayuguan, Suzhou to Beijing and back via Kashgar to Herat), various aspects of culture along way, including Buddhism, and reception at Ming court. Read the bibliography. 1435-1439. Pero Tafur. A native and notable of Cordoba, born ca. 1410, Tafur traveled from Spain to the Eastern Mediterranean and back. While not a merchant, he was very interested in commercial affairs and well connected with the trading networks. He was in Egypt, the Black Sea region and in the sad remains of the dying Constantinople; while he thought about going to India, the closest he came was a conversation with the famous traveler Nicolo di Conti, whom he met on the latter's return journey from South Asia. Read the bibliography. 1436-1452, 1473-1479. Giosofat Barbaro.A merchant who spent a decade and a half in the Venetian colony of Tana at the mouth of the Don River and then in the 1470s traveled as an ambassador to Persia. In his "Journey to Tana" he describes the regions adjoining the Black Sea as well as distant Muscovy, which he never visited; his "Journey to Persia" follows closely his official report on his mission. The latter, at least, incorporates information from other travelers and presumably was influened by the author's having seen the Persian travels of Contrarini. Read the bibliography. 1466-1472. Afanasii Nikitin. A merchant from the Russian city of Tver on the upper Volga River who traveled through Persia to India and spent more than 18 months there. He died just before reaching home. The largest part of his travel account describes India; the account is of some interest for his advice to fellow Christian merchants to leave their faith at home and profess Islam if they wished to prosper on the Silk Road. There is a 1958 Russian film based on his journey; a Soviet oceanographic expedition named a newly discovered undersea mount off the southern coast of India for Nikitin. Read the bibliography. 1474-1477. Ambrogio Contarini.Venetian ambassador to Persia, who traveled through Central Europe, Ukraine, the Crimea and the Caucasus. In Persia he spent time in Tabriz and Isfahan, and returned home via Muscovy and Poland. Although he traveled rapidly, he was a good observer. Apart from what he relates about conditions in the Caucasus and Persia under Uzun Hasan, his narrative is of considerable interest for its material on Moscow in the important reign of Grand Prince Ivan III. Read the bibliography. 1490s-1530. Babur. The great-great-great-grandson of Timur (Tamerlane), Zahiruddin Muhammad Babur (1483-1530) wrote a stunning memoir of his early life and struggles in Central Asia and Afghanistan before finally settling in northern India and founding the Mughal Empire. His Baburnama offers a highly educated Central Asian Muslim's observations of the world in which he moved. There is much on the political and military struggles of his time but also extensive descriptive sections on the physical and human geography, the flora and fauna, nomads in their pastures and urban environments enriched by the architecture, music and Persian and Turkic literature patronized by the Timurids. His most recent translator declares, "said to 'rank with the Confessions of St. Augustine and Rousseau, and the memoirs of Gibbon and Newton,' Babur's memoirs are the first--and until relatively recent times, the only--true autobiography in Islamic literature." Read the bibliography. 1557-1560, 1561-1564, 1566-1567, 1571-1572. Anthony Jenkinson. Representing the English Muscovy Company and accompanied by Richard and Robert Johnson, traveled via the White Sea and Moscow, down the Volga River and across the Caspian Sea to Bukhara and then back by the same route in 1557-60. In 1561-1564, via the same route to the Caspian, he went to Persia to try negotiating trade agreements; spent the winter in Kazvin discussing the spice trade with Indian merchants. Jenkinson's subsequent trips did not take him beyond Moscow. Beginning in 1546, well prior to his Russia service, Jenkinson had traveled widely in the Mediterranean and the Levant. Read the bibliography. 1579, 1580-1582, 1583-1584. John Newbery.A London merchant, Newbery undertook three trips. The first went only as far as the Levant. The second took him from the Levant through Mesopotamia to the Persian Gulf and Hormuz and then back through central Persia, the southern fringe of the Caucasus, Anatolia, and Eastern Europe. On the third he was accompanied by Ralph Fitch (see separate entry), John Eldred (who stopped short of the Persian Gulf), William Leeds and James Story all the way to the Mughal court in India. Newbery died on the route home. He was the first Englishman to visit several of these regions. Unfortunately, he never wrote much about his travels--notes on the first and especially the second trip were apparently worked into a narrative by Purchas in the 17th century; the third trip is known from some letters, Fitch's account, and Linschoten. Read the bibliography. 1583-1591. Ralph Fitch.English merchant (d. 1611) who traveled with John Newbery (s. v.) via the Levant and Mesopotamia to India, through northern India and on as far as Malacca (in Malaysia) before returning home via the Persian Gulf, to discover in London that he was presumed dead and his property had been divided among his heirs. He later returned to Aleppo. He apparently did not keep a diary; in writing down his account, in part with the encouragement of Hakluyt, he drew upon the travel account by the Italian Cesare Federici. The Indian section of Fitch's account is "disappointingly meagre and haphazard"; clearly he must have known a lot more than made its way into writing. Since, unlike Newbery, he survived to tell the tale, he often is given the greater prominence of the two. Read the bibliography. 1602-1607. Benedict Go�s. In 1594 the Portuguese Jesuit Benedict Go�s joined a mission to the Mughal Emperor Akbar, where he was chosen by the Jesuit leadership (partly because of his knowledge of Persian) to travel on an exploratory mission to China via Kashgar. He died before reaching Beijing; what survived of his notes and letters and some oral accounts were later (1615) combined by the famous Jesuit missionary Matteo Ricci into his travel journal. Despite some inconsistencies and problems in dating, the account is a unique record by a European of travel on the overland trade routes in inner Asia at the beginning of the seventeenth century. One is struck by the route itself-- heading northwest into Afghanistan before going north across the Hindu Kush to the headwaters of the Amu Darya, then east to Sarikol and on to Yarkand and Kashgar before skirting the Taklamakan on the north. The account details human and natural threats to travel and other aspects of the inner Asian trade, and provides some valuable information on the political divisions of the time. Read the bibliography. 1615-1616. Richard Steele and John Crowther. Agents for the British East India Company, traveled from Agra, the Mughal capital in N. India, overland via Kandahar to the Safavid capital Isfahan. Their account highlights the continuing importance of the overland trade routes, in part as a way of avoiding the Portuguese control of the Indian Ocean ports. There is interesting information on the role of the Afghan nomads along the route and an emphasis on the relative safety of travel in the period of Mughal and Safavid strength and stability. Steele then returned to England by traveling overland to the Mediterranean and taking a boat via Marseilles; Crowther returned to India. Read the bibliography. 1629-1675. Jean Baptiste Tavernier. French merchant/jeweler who probably knew the overland trade routes through Persia better than any other European in the seventeenth century. His six voyages took him to the Ottoman Empire, Safavid Persia and Mughal India; his interactions with the merchant communities (notably the Armenians in Persia) gave him an insider's perspective. His account reflects the editing of a professional writer but is precise and detailed. Read the bibliography. 1633-35, 1635-39, 1643. Adam Olearius. Secretary to Embassy of Holstein and (in 1643) Ambassador from Holstein. First and third missions were to Moscow; second went through Moscovy to Persia, where he spent a year and the conduct of one of its members did a great deal to discredit the enterprise. Well-educated at the University of Leipzig, Olearius compiled one of the most widely read and detailed accounts of Muscovy and Persia, seen through the lens of his Protestant upbringing and learned European perspective. It was published first in 1647; the revised German edition of 1656 became the standard one and drew upon a wide range of other sources. It was translated into several languages and frequently re-published. Read the bibliography. 1664-1667, 1671-1677. John Chardin. A French Hugenot jeweler, Chardin spent significant time in the Caucasus and Persia and traveled to India. His is one of the major European accounts of Safavid Persia, whose value is enhanced by his good knowledge of Persian. Persecution of Protestants in France forced him to flee to England, where he was recognized as an expert on the Middle East. Read the bibliography. 1682-1693. Hovhannes Joughayetsi. Armenian merchant who traveled and traded between New Julfa (the Armenian suburb of Isfahan), Northern India and Tibet. He spent five years in Lhasa. His commercial ledger is a unique source of information on products, prices, trading conditions, and the Armenian commercial network on the seventeeth-century routes involving the Safavid and Mughal empires. Read the bibliography.